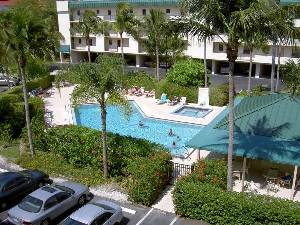 Photo 1 - Naples, FL - Florida Rental Condominium - Why stay in a Hotel? 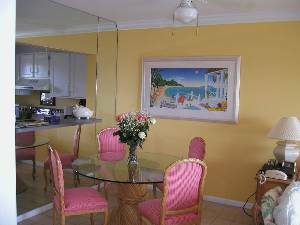 This decorator finished unit is well furnished and has a beautiful view over Naples Bay. 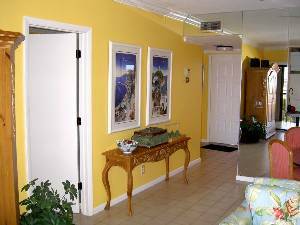 It is located in the Beau Mer condominiums next to the Old Naples Yacht Club, and is an easy walk to the shops, restaurants and night spots of the Olde Naples area of Fifth Avenue and the new area of Bayfront. This is Naples at its best. Even the beach is within walking distance. 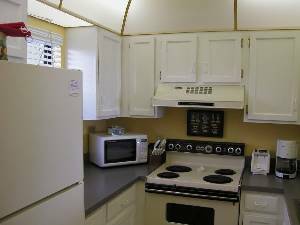 This Non-Smoking unit has a king-size bed, a living room with TV and VCR, a dining area, and fully-equipped kitchen. It has a large closet in the bedroom, a dressing area, and bath with step-in shower. There is a washer/dryer in the unit. Linens are supplied. There is a beautiful view from the lanai. My wife and I (a mature couple, as they say) rented this condo for one week in April. 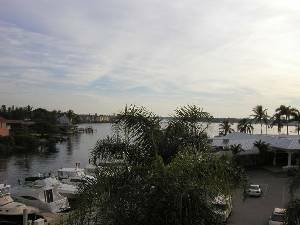 Though it is only one bedroom, the condo is very well designed and roomy and very attractively decorated, with a lovely view from the lanai over a marina and the bay. Beau Mer is only a few blocks from the center of Olde Naples and we rented bikes for the week. One of the nicest things for us was the friendliness of the people in the complex; each visit to the pool we made new friends. The only downside of this charming place is that Beau Mer itself is not terribly attractive from the outside, but our hesitations ended as soon as we saw the inside of the condo. We thoroughly enjoyed our two-week stay in February. The condo was comfortable and well-equipped. 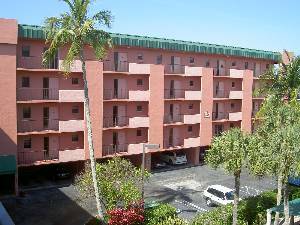 The location is very convenient to the Olde Naples restaurants, shops and beaches. The view from the lanai is terrific. We definitely would consider staying at this condo again..
Just wanted to let you know that we had a wonderful time at your condo. It really is a great location and we could walk to so many things. My sister and her husband have a place at Forest Glen CC and we spent the week going back and forth which was great. The weather was beautiful and your condo is lovely. Thanks for helping us get on the internet because it allowed me to respond to my office e-mail. Thanks again. 10/07/07This condo was really a home from home. 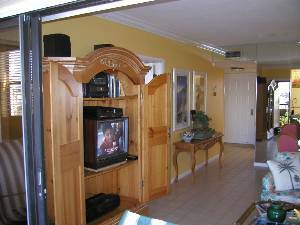 It has been the best equipped condo we have had on all out vistis to the USA.The location was ideal for us, the restaurants were superb. 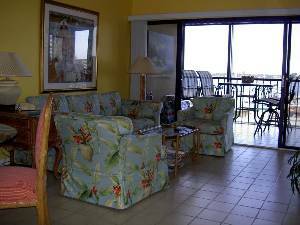 I would certainly reccommend the condo to anyone looking for a relaxing and comfortable holiday. margaret and Alan Edinburgh, Scotland. This condo ia an absolute jewel. It is beautifully furnished and is amazingly well equipped. THe views are beautiful. The location is great, easy walking distance to 5th Avenue. It is luuxurious but welcoming and cosy. It was our little home from home for nearly 3 weeks and was heaven. We really enjoyed the condo. It was very convenient to everywhere we had to be last week. Deposit: $500 per month, $125 per week, refundable. Cancellations and Refunds: 30 days. No pets, motorcycles or pickup trucks (condo rules).